Hi, and welcome to my teaser blog page. 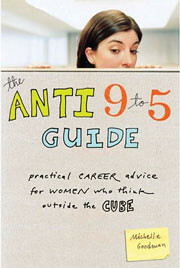 I actually blog like a banshee at www.anti9to5guide.com and have been doing so since September 2006 to support my forthcoming book, The Anti 9-to-5 Guide: Practical Career Advice for Women Who Think Outside the Cube. Please visit me at my permanent blog home, where you’ll find new blog posts daily (or dang close to it).